Washington’s gratuitous raising of tensions with Russia that we have been witnessing for many years is so reckless and irresponsible that we need some relief from the depression of it all. Perhaps I am grasping at straws, but here are some hopeful developments. An establishment journalist, Michael Goodwin, the chief political columnist for the New York Post and a former bureau chief for the New York Times, has blamed the New York Times and Washington Post for the destruction of journalistic standards in the United States. “I think we have ample facts revealed to us during this last year and a half that high-ranking people throughout government, not just the FBI, high-ranking people had a plot to not have Hillary Clinton, you know, indicted. Kallstrom goes on to name names. Senator Rand Paul vows to block the appointments of Mike Pompeo and Gina Haspel as Secretary of State and Director of the CIA. Read and rejoice. It is possible that the firing of Deputy FBI Director McCabe has opened for public exposure the plot hatched by the CIA, FBI, Departments of Justice and State, Hillary Clinton, and the Democratic National Committee to cover up Hillary’s felonies and to falsely accuse Donald Trump of conspiring with Russian President Putin to steal the US presidential election. If Trump doesn’t chicken out, it is possible to put Brennan, Comey, McCabe, Hillary, and many others in prison for their egregious and bold assaut on American democracy and the rule of law. 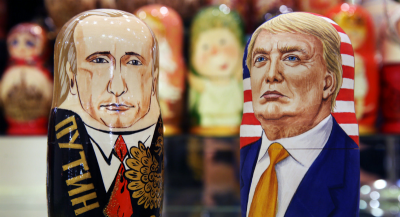 These prosecutions would break the power, of much of it, of the secret national security state, and, thereby, make it possible for Trump to return to his campaign promise to normalize relations with Russia. If these relations are not normalized, war will be the result. But at least now there is a chance. Amb. Murray goes on to establish that there is no evidence that Russia ever developed such a nerve agent and that the Organisation for the Prohibition of Chemical Weapons (OPCW) found no such agent when it oversaw and verified Russia’s destruction of Russian chemical weapons. Amb. Murray reports that the only known synthesis of what is being called “Novichok” occurred in 2016 by Iran in cooperation with the Organisation for the Prohibition of Chemical Weapons in order to test whether formulas published in a book many years ago could actually produce such an agent. Amb. Murray exposes the utterly corrupt presstitutes that comprise the Western media for never once asking the corrupt UK government about its hedge words, “of a type developed by Russia” and for their efforts to silence him with libel and slander. As important as Amb. Murray’s factually uncontested findings are, the main point is that no laboratory has reported any finding that such a nerve agent was used on Skirpal and his daughter. We don’t even know if any attack occurred on Skirpal. The corrupt British government has provided no evidence of any attack and no evidence of any nerve agent. What is the real reason for the British government’s completely obvious blatant lies? What is the real reason for the complete failure of the media to investigate and report an alleged event? How much more evidence does the world need that the Western media is nothing but a collection of liars devoid of all integrity who serve as a Propaganda Ministry for undeclared government agendas? The Skripal Affair is the final nail in the coffin of the Western media.